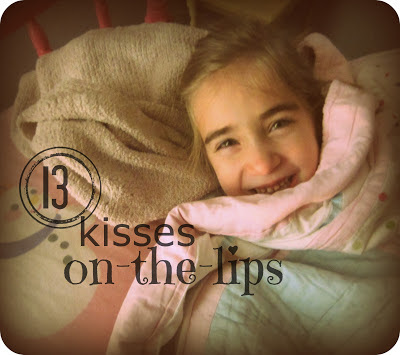 When I kissed this little girl goodnight I aimed just left of her little lips because I recently had a cold sore and got in the habit of dodging lips. I get the nasty blisters (yes, technically herpes) any time I'm deeply or suddenly stressed. Sometimes I know I'm stressed and start worrying about getting a cold sore, probably increasing my chances, so I start stressing about stressing. So one of my lofty wishes for my children is that they can go through stressful times without ugly blisters cropping up on their faces. Lofty, I know. Someone, pull me back. Her eyes got big and she said, "I want a kiss on the lips." Since the threat is actually over, I happily kissed her on her lips, but my heart warmed because I knew she wanted me to. Like she didn't feel quite close enough to me with the cheek kiss. Just to be sure there was no danger of her feeling that way for more than five seconds, I gave her two kisses. As a caregiver, stress is our middle name, and I too find myself stressing over being stressed. But then I remind myself who it's for, someone you love, and the risk is totally worth it.